SHANNONVILLE, Ontario (July 5, 2011) – Shannonville Motorsport Park – Canada Day was marked by qualification rounds of the Harley-Davidson® XR1200® Cup, as part of the doubleheader Canadian Superbike Series event hosted in Shannonville, Ontario on July 2. The qualifiers saw a banged-up Darren James of Ruthless Racing shake off the pain of a late practice session crash on Friday and bravely soldier on, with surprisingly good lap times. As MotoSport Plus of Kingston rider, Steve Crevier, and Privateers Harley-Davidson® of Nova Scotia rider, Cody Matechuk, resumed hostilities, Sherbrooke Harley-Davidson® rider, Samuel Proulx, continued his push to the front of the XR1200® ranks with some impressive lap times, getting the second fastest lap times of the morning session, thus setting the stage for the race battle scheduled in the early afternoon. Going into race one, pole position holder, Steve Crevier, was awarded the Tactical Products of Canada Luminox watch. As advertised, Round two on Saturday turned out to be a barn-burner, with spectators in the grandstands on the edge of their seats for the entire race. Right off the start, an early four-way battle ensued with Crevier and Matechuk taking the lead in the 16-lap final. The best seat in the house went to Samuel Proulx, who pushed his way into third, ahead of Darren James, who refused to show any signs of letting up. Olivier Spilbourghs, riding for Trev Deeley Motorcycles, got involved in a three-rider battle with Harley-Davidson® de L’Outaouais rider, Elie Daccache, and Vision Harley-Davidson® rider, Chris Harmon. Just behind them, John Ross McRae, riding for the Ruthless Racing Camp, pulled away from Kitchener Harley-Davidson® rider, Steve Hoffarth. Matechuk continued to show Crevier a wheel at every corner, but in the end was unable to make good on his threat to get around and he handed first place to Crevier. This left Matechuk and Crevier leading the series in a points tie. Proulx held his position for third and Darren James earned a hard-fought fourth place finish in the race, as well as the Performance Under Gear “Performance of the Race” Award. As soon as the start lights flashed the second half of the double-header weekend at Shannonville Motorsports Park was off to an exciting start with Privateers Harley-Davidson® of Nova Scotia rider, Matechuk, jumping into the early lead of Round three. But hot on his tail was MotoSport Plus of Kingston rider, Crevier. 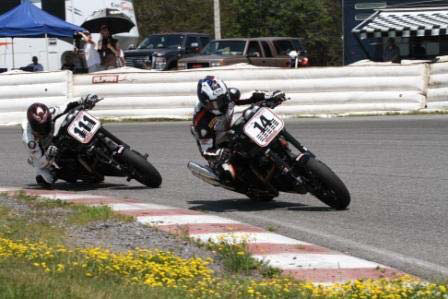 Sherbrooke Harley-Davidson® rider, Proulx, had his hands full as Darren James pushed the young rider through every corner of the tight Shannonville Pro track until technical issues forced James to silence his engine. When the chequered fabric was aired out at the finish line, it was Steve Crevier with the deciding win in the weekend event. Matechuk chased him all the way to the line for a hard-earned second. Proulx held off the advances of the battling trio behind him to grab his rightful third spot on the podium where he was rewarded for his efforts with the Performance Under Gear “Performance of the Race” Award. Round four will be held at the Autodrome in Saint-Eustache, Quebec from July 8 to 10. For further information on the series, please refer to http://www.csbk.ca. 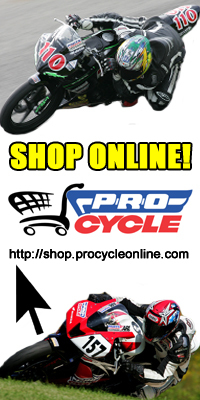 Posted on July 6, 2011, in CSBK - Canadian Superbike Series. Bookmark the permalink. Leave a comment.